Draft: 2008, Minnesota Twins, 1st rd. Full name is Aaron Michael Hicks…has a son, Aaron Michael Hicks Jr...Graduated from Woodrow Wilson High School in Long Beach, Calif. in 2008, where he hit .407 (114-for-280) with 24 doubles, 10 triples and 6HR in 97 games…also pitched, going 11-2 with a 1.11 ERA (94.1IP, 15ER) and 144K in 13 games started…played in the 2007 AFLAC All-American High School Baseball Classic…was named to the Baseball America All-American Second Team in 2008...Is a product of Major League Baseball's Urban Youth Academy in Compton, Calif...Played golf growing up and has participated in numerous charity golf tournaments...In September 2018, joined Didi Gregorius to serve as ambassadors for the PitCCh In Foundation's "Welcome Back to School" assembly and backpack giveaway in the Bronx at PS/MS 71. Hit .248 (119-for-480) with 90R, 18 doubles, 3 triples, 27HR, 79RBI, 90BB and 11SB in 137 games (129 starts in CF, 2 at DH) in his third season with the Yankees…set single-season career highs in runs scored, hits, home runs, extra-base hits (48), RBI and walks (previous: 54R, 15HR, 33XBH, 52RBI, 51BB in 2017; 90H in 2015)...Ranked third among Major League switch-hitters with 27HR…is the seventh switch-hitter in Yankees history to hit at least 25HR in a season, joining Mickey Mantle (10x), Bernie Williams (5x), Mark Teixeira (4x), Tom Tresh (3x), Jorge Posada (2x) and Nick Swisher (2x)...Hit 11HR in 31G as a leadoff hitter and 16HR in 106G in all other spots in the lineup…had 21HR over his final 88G after hitting just 6HR in his first 49G...Was the first Yankee with multiple inside-the-park HRs in the same season (4/13 at Detroit and 5/19 at Kansas City) since Mickey Mantle (three in 1958)…became the sixth player in the last 20 seasons (since 1999) to have multiple ITP HR in the same season, joining Charlie Blackmon (2017), Brandon Barnes (2014), Tony Gwynn Jr. (2010), Mark Teahen (2008) and Jimmy Rollins (2004)...Joined Didi Gregorius as the first pair of Yankees each with at least 20HR and 10SB in the same season since 2009 (Damon/Rodriguez)...Hit .636/.690/1.045 (14-for-22) with 9R, 1 double, 1 triple, 2HR, 5RBI and 6BB in seven games against Kansas City, the third-highest BA by any player against a single opponent in 2018 (min. 15AB) behind only Steve Pearce (.667, 10-for-15 vs. Kansas City) and Scooter Gennett (.654, 17-for-26 vs. Los Angeles-NL)…had multiple hits and reached safely at least three times in each of his six starts vs. Kansas City, tying the Yankees' Roy White (8/15/70-6/4/71) for the longest such streak by an opponent in Royals history...Was placed on the 10-day disabled list from 3/30-4/12 with a right intercostal muscle strain (missed 11 team games)…played two rehab games with Triple-A Scranton/Wilkes-Barre...Hit two-run inside-the-park HR and solo HR in 4/13 win at Detroit…was his first career inside-the-park HR and first by a Yankee since Curtis Granderson on 8/21/11 at Minnesota…it had been 1,022 games since Granderson's homer, the Yankees' second-longest drought with no inside-the-park HRs in team history (1,523 games from 8/30/99-5/14/09)…is the first Yankee to hit both an inside-the-park HR and a homer over the fence in the same game since Hank Bauer on 5/30/56-G2 vs. Washington at Yankee Stadium (Stats Inc.)…Bauer homered off Camilo Pascual leading off the first inning and hit a two-run inside-the-park home run off Tex Clevenger in the eighth…was his fourth career multi-HR game (first since 6/9/17 at Baltimore)...Made his first career start in the cleanup spot in the starting lineup in 5/20 win at Kansas City...Hit .279 (24-for-86) with 6HR in 24 games in June…had a season batting average of .230 (32-for-139) with 5HR in 39 games through the end of May...Played in his 500th Major League game in 6/4 Game 1 win at Detroit (0-for-4, 1BB)...Homered in a career-high three straight games from 6/17-19...Hit leadoff HR in 6/26 win at Philadelphia…was his third career leadoff HR and first as a Yankee (first since 9/7/15 at Kansas City w/ Minnesota)...Reached base safely multiple times in 18-of-22 home games from 7/1-8/19, batting .343/.510/.643 (24-for-70) with 22R, 3 doubles, 6HR, 16RBI and 25BB over the span... Hit two-run HR and two solo HRs and was 3-for-4 with 1BB in 7/1 win vs. Boston…was his first career 3HR game and the first by a Yankee since Alex Rodriguez on 7/25/15 at Minnesota…became the fourth player (second Yankee) with 3HR in a game at the current Yankee Stadium, joining Curtis Granderson on 4/19/12 vs. Minnesota, Detroit's J.D. Martinez on 6/21/15 and Kansas City's Lorenzo Cain on 5/10/16…was joined by Texas' Ronald Guzman on 8/10/18…is the first Yankees leadoff hitter ever to hit 3HR in a game and just the 27th instance in Major League history (joined by St. Louis' Matt Carpenter on 7/20/18)…homered from both sides of the plate for the second time in his career (also 4/13/17 vs. Tampa Bay)…was his fifth career multi-HR game and second of the season (also 4/13 at Detroit-2HR)...Had 49BB in 61 games following the All-Star break, tied for second-most in the Majors (tied for first in the AL)...Drew at least 1BB in 10 consecutive starts from 7/15-8/2 (13BB total), tied for the longest such streak by a Yankee since Jorge Posada's 11-start walk streak from 5/11-29/04...Posted a .433 OBP over a 39-game span from 7/26-9/5 (37H, 36BB, 1HP)...Hit eighth-inning game-tying two-run HR in 8/28 win vs. Chicago-AL…was his first game-tying HR since 8/17/15 at Yankee Stadium w/ Minnesota…was his third career go-ahead HR in the eighth inning or later, but his first with his team trailing...Had an extra-base hit in four straight games from 9/19-22 (2 doubles, 1 triple, 2HR) after not having an XBH over his previous 12 games...Scored a career-high-tying 4R in 9/21 win vs. Baltimore (also 8/12/15 vs. Texas), going 2-for-3 with 1HR, 2RBI and 2BB…hit in the leadoff spot in the starting lineup for the first time since 8/30 vs. Detroit...Recorded his first "walk-off" hit as a Yankee and the third of his career (also singles on 5/15/14 vs. Boston and 9/16/14 vs. Detroit) with an 11th-inning double on 9/22 vs. Baltimore to clinch the Yankees' postseason berth...Was removed from 9/24 win at Tampa Bay in the bottom of the fourth inning with a tight left hamstring…missed the following three games with the injury...Hit .222 (2-for-9) with 1R, 1 double and 1RBI in three postseason games…was removed from ALDS Game 1 at Boston in the fourth inning with right hamstring tightness and missed the following two games. Hit .266 (80-for-301) with 54R, 18 doubles, 15HR, 52RBI, 51BB and 10SB in 88 games (50 starts in CF, 16 in LF and 10 in RF) in his second season with the Yankees…set single-season career highs in runs, doubles, home runs, RBI and walks…of his 15HR, 12 were hit at Yankee Stadium... Recorded his second career multi-HR game (also 5/13/13 vs. Chicago-AL w/ Minnesota) in 4/13 win vs. Tampa Bay…homered from both sides of the plate in the game, becoming the ﬁrst Yankee to do so since Mark Teixeira on 7/31/15 at Chicago-AL…hit 4HR in a ﬁve-game span from 4/13-19... Hit his ﬁrst career pinch-hit HR in the eighth inning of 4/19 win vs. Chicago-AL…was the ﬁrst pinch-hit HR by a Yankee since Billy Butler on 9/16/16 at Boston... Reached base safely in a career-high 21 consecutive games from 5/23-6/14…hit .342/.413/.595 (27-for-79) with 16R, 11 doubles, 3HR, 17RBI and 11BB during the stretch... Established career highs with 6RBI and 3 doubles in 6/1 win at Toronto, going 4-for-5 with 2R…was the third Yankee since 1954 with at least 6RBI without a home run (also Jorge Posada-6RBI on 6/6/98 vs. Kansas City and Joe Girardi-7RBI on 8/23/99 at Texas)... Was placed on the 10-day disabled list from 6/26-8/10 with a right oblique strain…combined to appear in seven rehab games with Triple-A Scranton/Wilkes-Barre and Double-A Trenton from 8/2-9…was removed from 6/25 loss vs. Texas in the top of the ﬁfth inning with the injury... At the time he was placed on the D.L. on 6/26, had a .398 OBP, ninth-best in the Majors and second-highest in the AL behind only teammate Aaron Judge (.440)... Hit eighth-inning go-ahead solo HR in 8/14 win vs. the Mets…was his second career go-ahead HR in the eighth inning or later (also a tie-breaking two-run HR in the ninth on 9/26/16 at Toronto)... Was placed on the 10-day disabled list from 9/3-25 with a left oblique strain…was removed in the seventh inning of 9/2 win vs. Boston with the injury... Prevented a grand slam in the ﬁrst inning of 9/6 win vs. Tampa Bay, reaching over the CF fence to catch Wilson Ramos' bases-loaded ﬂy out and holding the Rays to a sac ﬂy on the play…was removed defensively in the seventh…was reinstated from the 10-day D.L. prior to the game... Hit his second career pinch-hit home run in 9/28 loss vs. Tampa Bay (also 4/19/17 vs. Chicago-AL)... In 13 postseason games, hit .196 (9-for-46) with 5R, 2 doubles, 1HR and 5RBI…hit safely in each of his ﬁrst six postseason games, the sixth-longest hitting streak to begin a postseason career in Yankees history: Thurman Munson (11G), Chris Chambliss (10G), Derek Jeter (9G), George Selkirk (9G) and Earle Combs (7G)... Made his postseason debut in the Yankees' AL Wild Card win vs. Minnesota…in ALDS Game 1 loss at Cleveland, collected the Yankees' ﬁrst hit of the game-and only extra-base hit-with a sixth-inning double... Hit his ﬁrst career postseason homer in ALDS Game 2 loss at Cleveland, a go-ahead three-run HR oﬀ Corey Kluber. Hit .217 (71-for-327) with 32R, 13 doubles, 8HR and 31RBI in 123 games (52 starts in RF, 20 in LF and 20 in CF) in his first season with the Yankees…was the only Major League player to make at least 20 starts at all three outfield positions in 2016…was the first Yankee to do so since Joe DiMaggio in 1936. Of the 16 outfield throws of at least 100 mph tracked by MLB Statcast in 2016, three were by Hicks…had an outfield assist to nab Danny Valencia at the plate to end the fourth inning on 4/20 vs. Oakland, with a throw recorded at 105.5 mph by MLB Statcast, making it the fastest throw by an outfielder since Statcast debuted at the start of the 2015 season…the previous record was 103.1 mph by Houston's Carlos Gomez in September 2015. Made his Yankees debut in 4/5 Opening Day loss vs. Houston, starting in LF…collected his first hit as a Yankee with a seventh-inning single in 4/6 win vs. Houston. Missed four games from 4/23-26 with left shoulder bursitis…suffered the injury in 4/22 win vs. Tampa Bay diving for a fly ball in the fourth inning. Hit game-winning solo HR-his first HR as a Yankee-in the seventh and was 1-for-2 in 5/6 win vs. Boston…was his first career go-ahead HR in the seventh inning or later…snapped an 85AB homerless stretch (first HR since 9/17/15 vs. Los Angeles-AL w/ Minnesota). Hit .280 (23-for-82) with 4HR and 9RBI in 26 games in August…over the first four months of the season, batted just .187 (39-for-209) with 3HR and 19RBI in 86 games. From 8/11-10/2, hit .286/.350/.440 (26-for-91) with 11R, 2 doubles, 4HR and 10RBI in 28 games. Was placed on the 15-day disabled list from 9/5 (retro. to 9/1) - 9/20 with a Grade 2 right hamstring strain…suffered the injury in 8/31 win at Kansas City and underwent an MRI in Baltimore on 9/1, revealing the strain. Hit a go-ahead two-run HR in the ninth inning of 9/26 win at Toronto…was his ninth career game-tying or go-ahead HR, his first in the ninth inning or later…was his first home run on the road in more than a year (9/7/15 at Kansas City w/ Minnesota)…each of his first 7HR of the season came at Yankee Stadium. Hit .256 (90-for-352) with 48R, 11 doubles, 11HR and 33RBI in 97 games (87 starts in CF, four in LF, four in RF) with the Twins...batted .307 (31-for-101) with 6HR and a .870 OPS off left-handed pitching...following the season, was named the 2015 Charles O. Johnson Award winner for "Most Improved Twin" by the Twin Cities Chapter of the BBWAA...Posted a .996 fielding percentage (254TC, 1E)...tied for 11th in the AL with nine outfield assists...Was recalled from Triple-A Rochester on 5/12 when Shane Robinson was placed on the Family Emergency List...Was placed on the 15-day disabled list on 6/14 with a right forearm strain...played in six rehab games with Rochester...was returned from rehab and reinstated from the D.L. on 7/3...Hit .346 (27-for-78) with 15R, 2 doubles, 2 triples, 4HR, 16RBI, 11BB and a .424 OBP in 23 games in July...Recorded five straight multi-hit games from 7/25-30, including consecutive 3H games on 7/29 and 7/30 (9-for-20)...Hit his first career leadoff HR (off Nick Martinez) in 8/12 win vs. Texas...tied a career high in hits in the game, going 4-for-5 with 4R, 1HR and 2RBI...Was placed on the 15-day disabled list on 8/20 with a left hamstring strain, suffered running to first base to beat out a ground ball on 8/19 at Yankee Stadium...was returned from rehab and reinstated from the D.L. on 9/4... Reached base safely in a career-high 13 straight games from 9/4-17, with 13H, 8BB and a .344 OBP over the span...Began the season with Rochester, batting .342 (51-for-149) with 2R, 13 doubles, 3HR and 20RBI in 38 games...Was traded to the Yankees on 11/11 in exchange for C John Ryan Murphy. Made Twins Opening Day roster for second consecutive season and was Opening Day centerfielder, batting eighth March 31 at Chicago-AL, going 2-for-3 with a double...Hit three-run home run April 24 at Tampa Bay, the first three-run homer of his career...Placed on 7-day disabled list May 2 with concussion-like symptoms, after crashing into the centerfield wall the previous night against Los Angeles-NL; reinstated May 9...Placed on 15-day disabled list June 13 with right shoulder strain, an injury he suffered diving for a ball June 7 vs. Houston; went on rehab assignment with Double-A New Britain, was reinstated from DL and stayed at New Britain, getting optioned directly there...Hit second career minor league grand slam July 20 at Reading...Hit .297 (44-for-148) in 43 games for the Rock Cats, including a .347 (35-for-101) batting average in July...Transferred to Triple-A Rochester August 5...Hit first career Triple-A home run August 14 at Indianapolis (24th career Triple-A game)...Recalled September 2...Hit second career walk-off hit September 16 vs. Detroit, an infield single off Joe Nathan giving the Twins a 4-3 win. Participated in his first Twins major league spring training and made the Twins Opening Day roster for the first time in career, leading off and playing center field April 3 vs. Detroit, going 0-for-4 with a walk...became the fourth different Twin to make his major league debut as the Opening Day leadoff hitter, joining Sergio Ferrer April 5, 1974; Hosken Powell April 5, 1978; and Jim Eisenreich April 6, 1982...Recorded first major league hit and RBI April 4 vs. Detroit, hitting a two-run single in the eighth inning off Brayan Villarreal...Recorded first career extra-base hit with a double April 27 vs. Texas...Reached base safely in 10 straight games April 15-28...Recorded first multi-homer game May 13 vs. Chicago-AL...according to Elias, he became the first Twins rookie to homer in back-to-back plate appearances in one game since Corey Koskie went deep in consecutive trips April 15, 1999 at Tiger Stadium...Hit first career three-hit game May 22 at Atlanta...Homered in consecutive games May 28 and 30 vs. Milwaukee...Placed on the 15-day disabled list June 10 with a left hamstring strain...played six games on rehab assignment with Triple-A Rochester and reinstated July 2...Hit .400 (10-for-25) with eight runs scored in first seven games back from the DL, including first career four-hit game July 8 at Tampa Bay...Optioned to Triple-A Rochester August 1...at time of option led AL rookies in runs (37) and tied for first in stolen bases (9)...had nine outfield assists, which ranked first among all AL players...Placed on 7-day disabled list August 13 with a right heel bruise, reinstated August 20...Despite playing 81 games, still finished tied for first among AL rookies in outfield assists (9), which also led the club...also, among AL rookies, was tied for fifth in home runs (8), tied for sixth in walks (24), eighth in runs scored (37) and tied for 10th in doubles (11). Spent entire season with Double-A New Britain. ... Named Twins minor league Player of the Week July 6, batting .381 (8-for-21) with one double, one home runs, two RBI and six runs scoredin six games. ... Set New Britain single-season record in runs scored (100) and triples (11)...led Eastern League in runs scored, triples and walks (79). ... Had season-high with five hits July 25 vs. Binghamton...recorded 33 multi-hit games. ... Batted .318 (35-for-110) with a .433 on-base percentage in 30 July games and .319 (36-for-113) with a .402 on-base percentage in 28August games. ... Ranked first among Twins minor leaguers in runs scored and stolen bases (32), second in triples (11) and walks (79), fourth in total bases(217), and fifth in hits (135). ... Named to Eastern League postseason All-Star team. ... Named outfielder on MiLB.com Twins organizational All-star team. ... Ranked eighth best prospect in Eastern League by Baseball America and named to the Baseball America Double-A All-Star team. ... Ranked fifth best prospect, best strike zone discipline, best defensive outfielder and best outfield arm in the Twins system by BaseballAmerica entering the 2013 season. ... Added to Twins 40-man roster in November. ... Played for the Bravos de Margarita in the Venezuelan Winter League, batting .204 (11-for-54) in 16 games. Spent entire season with Single-A Ft. Myers...ranked fourth best prospect, best defensive outfielder and best outfield arm in the Twins systemby Baseball America...rated best outfield arm in the Florida State League by Baseball America...ranked 18th best prospect in Midwest League byBaseball America...played for Mesa Solar Sox in the Arizona Fall League, batting .294 (30-for-102) with 25 runs, eight doubles, five triples, threehome runs, 21 RBI and 18 walks in 30 games. Spent entire season in Single-A Beloit...led team in on-base percentage (.401) and stolen bases (21)...finished second in doubles (27)and triples (6), and third in games played (115) and at-bats (423)...named to 2010 Midwest League All-Star Game...named Twins minor leaguePlayer of the Week September 3...ranked fifth best prospect in Midwest League by Baseball America...ranked second best prospect, best strikezone discipline, best defensive outfielder and best outfield arm in the Twins system by Baseball America...named honorable mention on MiLB.com's 2010 Twins organizational All-Star team. Finished third on Single-A Beloit in walks (40)...ranked the best prospect in Midwest League by Baseball America...ranked top prospect,best strike-zone discipline, best athlete, best defensive outfielder and best outfield arm in the Twins system by Baseball America entering 2010. Led GCL Twins in hits (55), home runs (4), RBI (27), walks (28) and stolen bases (12), and ranked eighth in GCL in average (.318)... namedTwins minor league Player of the Week July 25-August, batting .400 with one home run, four runs scored and four RBI...named Rookie Class All-Starby Baseball America...named top ranked prospect in GCL by Baseball America...GCL Postseason All-Star...ranked top prospect, best strike-zonediscipline, best athlete, best defensive outfielder and best outfield arm in the Twins system by Baseball America entering the 2009 season. 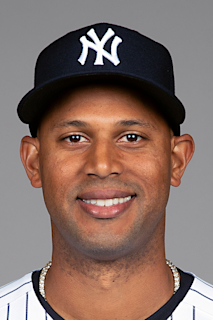 March 28, 2019 New York Yankees placed CF Aaron Hicks on the 10-day injured list retroactive to March 25, 2019. Left lower back strain. April 12, 2018 New York Yankees activated CF Aaron Hicks from the 10-day injured list. April 10, 2018 New York Yankees sent CF Aaron Hicks on a rehab assignment to Scranton/Wilkes-Barre RailRiders. March 30, 2018 New York Yankees placed CF Aaron Hicks on the 10-day disabled list. Right intercostal muscle strain. September 26, 2017 New York Yankees activated CF Aaron Hicks from the 10-day disabled list. September 3, 2017 New York Yankees placed CF Aaron Hicks on the 10-day disabled list. Left oblique strain. August 10, 2017 New York Yankees activated CF Aaron Hicks from the 10-day disabled list. August 8, 2017 New York Yankees sent LF Aaron Hicks on a rehab assignment to Trenton Thunder. August 2, 2017 New York Yankees sent CF Aaron Hicks on a rehab assignment to Scranton/Wilkes-Barre RailRiders. June 26, 2017 New York Yankees placed LF Aaron Hicks on the 10-day disabled list. Right oblique strain. September 20, 2016 New York Yankees activated LF Aaron Hicks from the 15-day disabled list. September 5, 2016 New York Yankees placed RF Aaron Hicks on the 15-day disabled list retroactive to September 1, 2016. Right hamstring strain. November 11, 2015 Minnesota Twins traded RF Aaron Hicks to New York Yankees for C John Ryan Murphy. September 4, 2015 Minnesota Twins activated CF Aaron Hicks from the 15-day disabled list. August 30, 2015 Minnesota Twins sent CF Aaron Hicks on a rehab assignment to Rochester Red Wings. August 20, 2015 Minnesota Twins placed CF Aaron Hicks on the 15-day disabled list. Strained left hamstring. July 3, 2015 Minnesota Twins activated CF Aaron Hicks from the 15-day disabled list. June 26, 2015 Minnesota Twins sent CF Aaron Hicks on a rehab assignment to Rochester Red Wings. June 14, 2015 Minnesota Twins placed CF Aaron Hicks on the 15-day disabled list retroactive to June 13, 2015. Strained right forearm. June 5, 2015 Minnesota Twins sent CF Aaron Hicks on a rehab assignment to Rochester Red Wings. May 12, 2015 Minnesota Twins recalled CF Aaron Hicks from Rochester Red Wings. March 28, 2015 Minnesota Twins optioned CF Aaron Hicks to Rochester Red Wings. October 14, 2014 CF Aaron Hicks assigned to Bravos de Margarita. September 2, 2014 Minnesota Twins recalled Aaron Hicks from Rochester Red Wings. August 5, 2014 CF Aaron Hicks assigned to Rochester Red Wings from New Britain Rock Cats. July 24, 2014 CF Aaron Hicks assigned to Rochester Red Wings. June 25, 2014 Minnesota Twins optioned CF Aaron Hicks to New Britain Rock Cats. June 18, 2014 Minnesota Twins sent CF Aaron Hicks on a rehab assignment to New Britain Rock Cats. June 13, 2014 Aaron Hicks roster status changed by Minnesota Twins. May 9, 2014 Minnesota Twins activated CF Aaron Hicks from the 7-day disabled list. October 10, 2013 OF Aaron Hicks assigned to Bravos de Margarita. October 2, 2013 Minnesota Twins activated CF Aaron Hicks. August 20, 2013 Rochester Red Wings activated CF Aaron Hicks from the 7-day disabled list. August 15, 2013 Rochester Red Wings placed CF Aaron Hicks on the 7-day disabled list retroactive to August 13, 2013. August 2, 2013 Minnesota Twins optioned CF Aaron Hicks to Rochester Red Wings. July 2, 2013 Aaron Hicks roster status changed by Minnesota Twins. June 25, 2013 Minnesota Twins sent CF Aaron Hicks on a rehab assignment to Rochester Red Wings. November 20, 2012 Minnesota Twins selected the contract of CF Aaron Hicks from New Britain Rock Cats. October 11, 2012 CF Aaron Hicks assigned to Bravos de Margarita. April 3, 2012 Aaron Hicks assigned to New Britain Rock Cats from Fort Myers Miracle. March 25, 2012 OF Aaron Hicks assigned to Minnesota Twins. June 4, 2011 Aaron Hicks roster status changed by Fort Myers Miracle. May 27, 2011 Fort Myers Miracle placed CF Aaron Hicks on the 7-day disabled list. April 5, 2011 CF Aaron Hicks assigned to Fort Myers Miracle from Beloit Snappers. March 22, 2011 CF Aaron Hicks assigned to Minnesota Twins. July 19, 2010 Aaron Hicks roster status changed by Beloit Snappers. June 19, 2009 CF Aaron Hicks assigned to Beloit Snappers from GCL Twins.